Press releases are an integral part of public relations strategy declaring the launch of companies and the related products and services. A press release is a short document highlighting the product released of late by a company, a significant event or an announcement or some other newsworthy items pertaining to a particular organization. It is the job of a public relations officer to create a press release that will be given to the journalists in the media to make news for the company and to build a reputation of the company. A press release is also written with the purpose of informing industry and creating interest in the potential customers regarding the relevant products and services.Therefore, it demands an effective crisp write up focusing on the product or service. Great press releases must incite the interest in the journalists so that they cover the news even further. An effective press release often happens to be the first step towards a successful launch of products and services leading to a television interview creating interests in potential customers and resulting in healthy sell which translates into profit. A press release thus creates more visibility for the products and the company as a whole. However, piquing the interest of a journalist is not easy as it sounds. The format of the press release is general but the content inside it should be something to grab the attention of the journalists who are flooded with plenty of stories to cover on a regular basis. 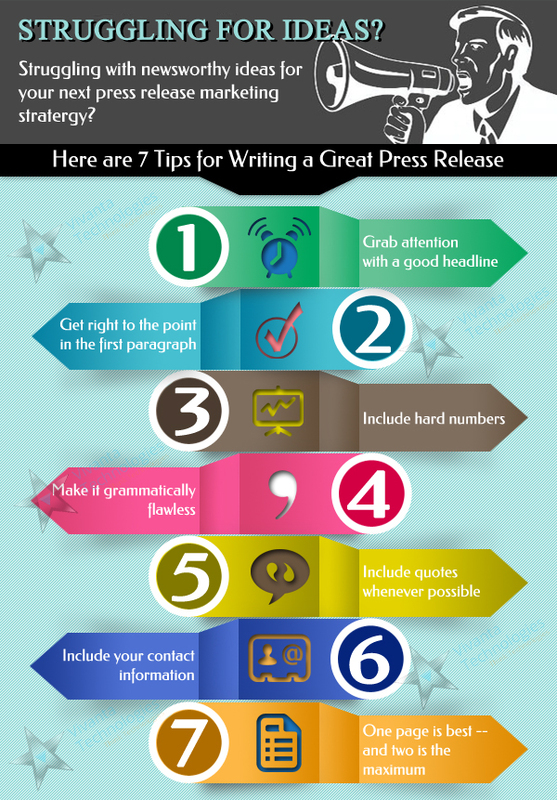 Here are some tips for writing a great press release. A good headline often gives a required head start to a great press release. The headline must be strong, accurate and of course engaging. With these three qualities you can draw the attention of journalists. The first paragraph is extremely important which should provide the most vital information regarding the product or service. The subsequent paragraphs should contain more information to support the first paragraph. Introducing the exact subject early is the key to attention from busy journalists. Quantifying your press release is important when tracing a trend. Simply a creative write up will not be upto the mark. There must be proof and quote numbers to pitch your company in the proper light. Press release writing does not need to be bombastic. Being grammatically error free is mandatory. It is important to create a good impression with the press release and a single error can cost you your reputation ending up in lost opportunity. Always use quotes from a significant person inside the company which lends credibility to the press release. A quote from CEO is most preferred. Remember that you want reporters to follow up with your news and hence providing accurate contact information is of immense importance. It is wise to provide all the information in a one page write up because journalists will have to invest less time to find out about the products or services.